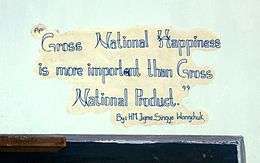 Slogan in Bhutan about Gross National Happiness in Thimphu's School of Traditional Arts. Buddhist economics is a spiritual approach to economics. It examines the psychology of the human mind and the anxiety, aspirations, and emotions that direct economic activity. A Buddhist understanding of economics aims to clear the confusion about what is harmful and beneficial in the range of human activities involving production and consumption, and ultimately tries to make human beings ethically mature. It tries to find a middle way between a purely mundane society and an immobile conventional society. Sri Lankan economist, Neville Karunatilake, wrote that ‘A Buddhist economic system has its foundations in the development of a co-operative and harmonious effort in group living. Selﬁshness and acquisitive pursuits have to be eliminated by developing man himself.’ Karunatilake sees the Buddhist economic principles as exemplified in the rule of the Buddhist king Ashoka. Bhutan's King Jigme Singye Wangchuck and their government have promoted the concept of 'Gross National Happiness' (GNH) since 1972, based on Buddhist spiritual values, as a counter to gauging a nation's development by gross domestic product (GDP). It represents a commitment to building an economy that would serve Bhutan's culture based on Buddhist spiritual values instead of western material development gauged by gross domestic product (GDP). Buddhist economics holds that truly rational decisions can only be made when we understand what creates irrationality. When people understand what constitutes desire, they realize that all the wealth in the world cannot satisfy it. When people understand the universality of fear, they become more compassionate to all beings. Thus, this spiritual approach to Economics doesn't rely on theories and models but on the essential forces of acumen, empathy, and restraint. From the perspective of a Buddhist, Economics and other streams of knowledge cannot be separated. Economics is a single component of a combined effort to fix the problems of humanity and Buddhist Economics works with it to reach a common goal of societal, individual, and environmental sufficiency. 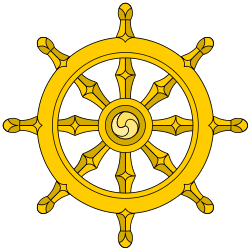 Buddhist ethics has been applied to the running of a state's economy since the rule of the Indian Buddhist emperor Ashoka (c. 268 to 232 BCE). Ashoka was famous for his extensive philanthropic and public works program, building hospitals, hostels, parks and nature preserves. The term 'Buddhist economics' was coined by E. F. Schumacher in 1955, when he traveled to Burma as an economic consultant for Prime Minister U Nu, and is used by followers of Schumacher and by Theravada Buddhist writers such as Prayudh Payutto, Padmasiri De Silva and Phrabhavanaviriyakhun. Schumacher's essay "Buddhist Economics" was first published in 1966 in Asia: A Handbook, and republished in his influential collection Small Is Beautiful (1973). The 1st Conference of the Buddhist Economics Research Platform, August 23–24, 2007 was held in Budapest, Hungary  and the 2nd in Ubon Ratchathani University, Warin Chamrab, Ubon Ratchathani Thailand from April 9–11, 2009. The third conference was supposed to be held in Brisbane, Australia on January 18–19, 2011 but was postponed until further notice. Suppose we consider the demand for a commodity, say cigarettes and consider that it has been showing an increasing trend. This trend will be supported by an increase in production of cigarettes. These cigarettes are then put into the market and purchased and consumed by people. When it is consumed, the demand is satisfied and normally, nobody bothers about the stage after consumption. But Buddhist Economists go beyond that and investigate how these trends affect the three intertwined aspects of human existence: The individual, society and the environment. Specific to an increase in the consumption of cigarettes, Buddhist Economists try to decipher how this increase affects the pollution levels in the environment, its impact on passive smokers and active smokers and the various health hazards that come along with smoking, thus taking into consideration the ethical side of economics. The ethical aspect of it is partly judged by the outcomes it brings and partly by the qualities which lead to it. The Buddhist point of view ascribes to work three functions: to give man a chance to utilize and develop his aptitude; to enable him to overcome his self-aggrandizement by engaging with other people in common tasks; and to bring forward the goods and services needed for a better existence. There are a number of differences between Western and Buddhist economics. First, while Western Economics concentrates on self-interest, the Buddhist view challenges it by changing the concept of self to Anatta or no-self. It posits that all things perceived by one's senses are not actually "I" or "mine" and therefore, humans must detach themselves from this feeling. They believe that the self-interest based, opportunistic approach to ethics will always fail. According to them, generosity will work because human beings are homines reciprocantes who tend to reciprocate to feelings (either positively or negatively) by giving back more than what is given to them. Second, Western economists give importance to maximizing profits and individual gains while the underlying principle of Buddhist economists is to minimize suffering (losses) for all living or non living things. Studies conducted by them have shown that human beings show greater sensitivity to loss than to gains and therefore people should concentrate more on reducing the former. Third, there is a difference with respect to the concept of desire. Western Economics encourages material wealth and desire because of which people try to accumulate more and more wealth—sometimes at the cost of others—to satisfy those cravings. In contrast, in Buddhist Economics, importance is given to simplify one's desires. According to them, apart from the basic necessities like food, shelter, clothing and medicines, other materialistic needs should be minimized. They say that overall well-being decreases if people pursue meaningless desires. Wanting less will benefit the person, the community they live in and nature. Fourth, views on the market are different. While Western Economists advocate maximizing markets to a point of saturation, Buddhist Economists aim at minimizing violence. According to them, Western Economists do not take into consideration primordial stakeholders like the future generations and the natural world because their vote is not considered important in terms of purchasing power. They feel that other stakeholders such as poor and marginalized people are under-represented because of their inadequate purchasing power and preference is given to the strongest stakeholder. Therefore, they believe that the market is not an unbiased place, truly representative of the economy. Thus, Buddhist Economists advocate ahimsa or non-violence. According to them, ahimsa prevents doing anything that directly causes suffering to oneself or others and urges to find solutions in a participatory way. Community supported agriculture is one such example of community based economic activities. They believe that it fosters trust, helps build value based communities and brings people closer to the land and the farm. Achieving this sustainability and non-violence requires restructuring of dominating configurations of modern business, which they advocate. This leads to deemphasizing profit maximization as the ultimate motive and renewed emphasis on introducing small-scale, locally adaptable, substantive economic activities. Fifth, Western economists try to maximize instrumental use where the value of any entity is determined by its marginal contribution to the production output while Buddhist economists feel that the real value of an entity is neither realized nor given importance to. They try to reduce instrumental use and form caring organizations which will be rewarded in terms of trust among the management, co-workers and employees. Sixth, Western economists tend to believe that bigger is better and more is more whereas Buddhist economists believe that small is beautiful and less is more. Seventh, Western economics gives importance to gross national product whereas Buddhist economics gives importance to gross national happiness. Buddhist economists believe that as long as work is considered a disutility for labourers and labourers a necessary evil for employers, the true potential of the labourers and employers cannot be achieved. In such a situation, employees will always prefer income without employment and employers will always prefer output without employees. They feel that if the nature of work is truly appreciated and applied, it will be as important to the brain as food is to the body. It will nourish man and motivate him to do his best. According to them, goods should not be considered more important than people and consumption more important than creative activity. They feel that as a result of this, the focus shifts from the worker to the product of the work, the human to the subhuman, which is wrong. According to them, people are unable to feel liberated not because of wealth but because of their attachment to wealth. In the same way, they say that it is the craving for pleasurable baubles and not the enjoyment from them that holds humans back. Buddhist Economists do not believe in measuring the standard of living by the amount of consumption because according to them, obtaining maximum well being as a result of minimum consumption is more important than obtaining maximum well being from maximum consumption. Thus, they feel that the concept of being 'better off' because of greater levels of consumption is not a true measure of happiness. From the point of view of a Buddhist economist, the most rational way of economic life is being self-sufficient and producing local resources for local needs and depending on imports and exports is uneconomic and justifiable only in a few cases and on a small scale. Thus, they believe in economic development, independent of foreign aid. Buddhist economics also gives importance to natural, renewable and non-renewable resources. They feel that non renewable resources should only be used when most needed and then also with utmost care, meticulously planning out its use. They believe that using them extravagantly is violent and not in keeping with the Buddhist belief of nonviolence. According to them, if the entire population relies on non renewable resources for their existence, they are behaving parasitically, preying on capital goods instead of income. Adding to this, they feel that this uneven distribution and ever increasing exploitation of natural resources will lead to violence between man. They also believe that satisfaction need not necessarily be felt only when something tangible is got back in return for giving something or something material is gained, as stated in modern economics. They say that the feeling of satisfaction can be achieved even when one parts with something without getting anything tangible in return. An example is when one gives presents to their loved ones simply because they want them to be happy. Buddhist economists believe that production is a very misleading term. According to them, to produce something new, the old form has to be destroyed. Therefore, production and consumption become complementary to each other. Taking this into consideration, they advocate non-production in certain cases because when one produces less materialistic things, they reduce exploitation of the world's resources and lead the life of a responsible and aware citizen. The concept of the "Middle Way" says that time should be divided between working towards consumption and meditation and the optimal allocation between these two activities will be when some meditation is utilized to lower the desire for consumption and to be satisfied with lesser consumption and the work that it involves. In economic terms this means “the marginal productivity of labour utilized in producing consumption goods is equal to the marginal effectiveness of the meditation involved in economizing on consumption without bringing about any change in satisfaction”. The Kañcanakkhanda-Jātaka tells the tale of a past Bodhisattva who was living as a farmer, and plowing a field one day chanced upon a massive block of gold. Pondering what to do with it, and seeing it was more than he could ever use, he decided to divide it in four equal parts. One for his living expenses, one for saving, one for trading, and one for donating to charity and good works. ↑ Gross National Happiness » Maintenance Mode Archived September 2, 2009, at the Wayback Machine. 1 2 3 4 5 6 Payutto, Ven. P. A. "Buddhist Economics - A Middle Way for the Market Place" (PDF). 1 2 3 4 5 6 Schumacher, E. F. "BUDDHIST ECONOMICS". Archived from the original on 13 December 2012. Retrieved 4 December 2012. ↑ "Policy Innovations - Redefining Progress". policyinnovations.org. Retrieved 18 July 2015. ↑ E. F. Schumacher: Life and Work Archived October 12, 2011, at the Wayback Machine. 1 2 3 4 5 6 7 8 Zsolnai, Laszlo. "Buddhist Economics for Business" (PDF). Retrieved 13 September 2011.